Trinity Designs: Big Shot Box - So Fun! Hey everybody, check this out! It's a box made with the Scallop Envelope Die from the Big Shot. How cool is that? I first saw this idea while at Founder's Circle and since then, I've seen it on many other blogs and websites so I thought I'd try my hand at making one of them. 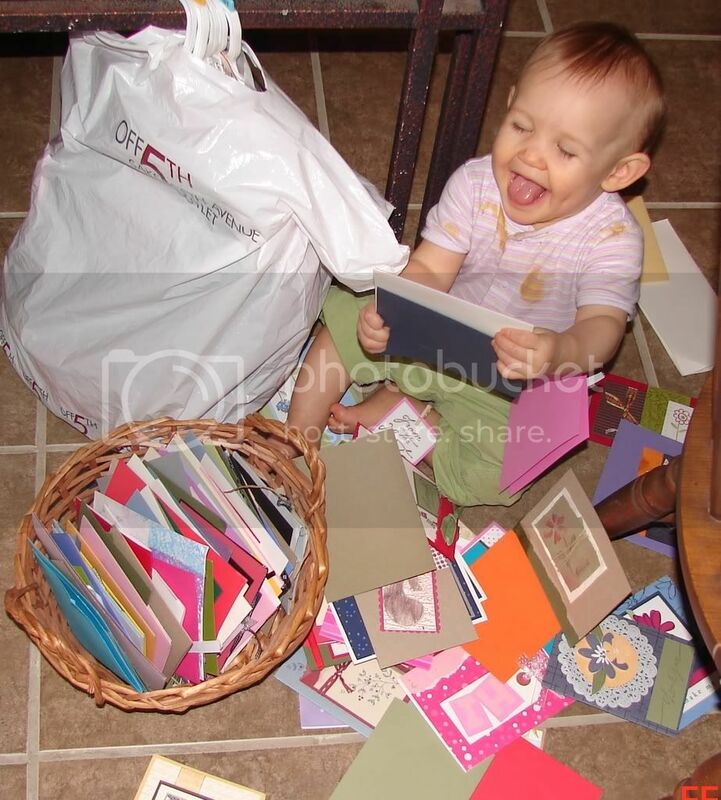 It was so super easy - first I cut four envelopes out of Tangerine Tango Textured Cardstock with my Big Shot and the die. Then I used Sticky Strip and attached the side flaps of the envelopes together to form the square of the box. I used some more Sticky Strip to fold the flaps down inside the box so they wouldn't stick out. the inside so when the top flaps were folded down, the texture would show. 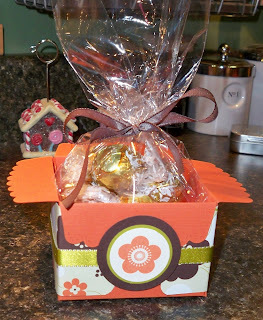 To embellish the box, I used a strip of Hawaii Papaya Designer Series Paper and wrapped it around. Since 12" is not long enough to meet in the middle, I punted and rounded the two bottom corners of the paper and placed a multi circle embellishment over it to meet the gap. The Circles were created with the NEW 1 3/4" Circle Punch, the 1 1/4" Circle Punch and the 1" Circle Punch. I stamped the flower in Tangerine Tango on Very Vanilla cardstock. The flower comes from Eastern Blooms and is one of the flowers on the block of 3. Chocolate Chip and Kiwi Kiss Cardstock formed the layers and I added a piece of that YUMMY Kiwi Kiss Satin Ribbon. 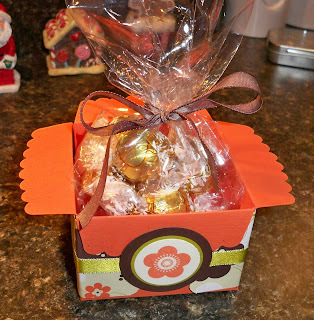 To make this box EXTRA yummy, I used a Small Cello Bag to hold some White Chocolate Truffles and tied it with some Chocolate Chip Taffeta Ribbon. All in all, a very fun, quick gift project. If you are in my Big Shots Club or in my Downline, YOU will be making this project. My Trinity Design Stampers Group meeting is this Sunday at 4 pm. We always have so much fun at our meetings. I'd love to have you join us someday! Speaking of the meeting, I keep forgetting to RSVP. My mom and I will both be there! How cute is this??? I love it. Great Job Robin! I really love the rounded corners on your strip that goes around the box. Since 12" isn't long enough the rounded corners is enought o finish the look and make it not need a filler piece! Great thinkin'! I love making these!!! After returning from FC I have made tons of these!! They are so much fun to make and I love giving them to my hostesses (this way it shows off the big shot). Yours turned out great! !